This one is a must, unless your original business is not particularly good or successful and you want to start another business because of that. In that case you are probably better off taking your losses and focus solely on your new business. 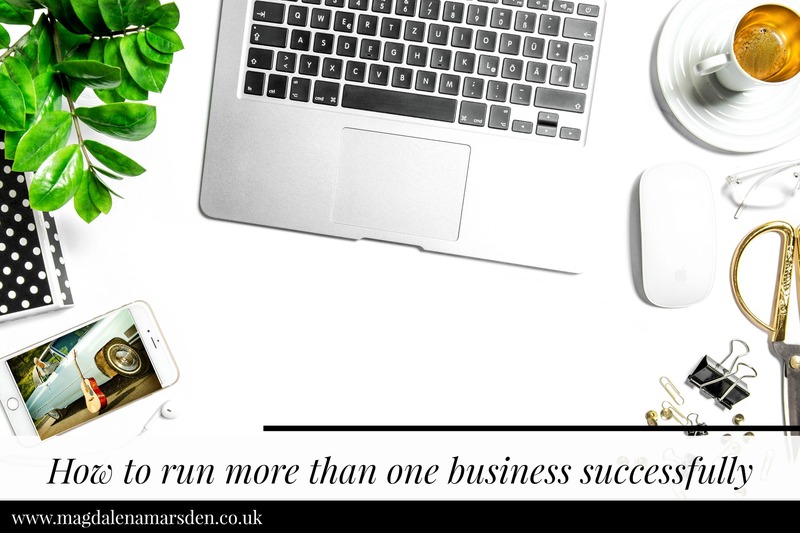 Your new business will need a lot of your attention and energy and having an existing business working well, helps to take the pressure off. By working well I mean, having regular income you can rely on and having most day to day tasks automated (if not actually ‘automated’ you have a way of streamlining everything and you know what needs to be done without thinking about it too much). When you start running multiple businesses, make sure you focus on what’s making you money first before you spend a lot of time on part of a business that needs more nurturing. 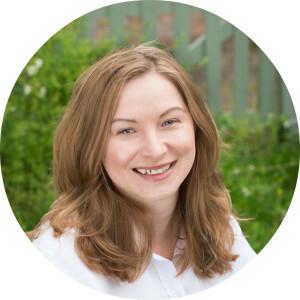 As much I would love to play with my new business venture, I have to be quite strict to complete first jobs that keep my main business running smoothly and then concentrate on the new venture. I’ve always been organised and I love planning. But after nearly 12 years in top management job, where my days were planned to the last minute, I suddenly felt very rebellious. So, when I started my first business, I often just did what I wanted to do and when I wanted to do it. One way or the other the work got always done, without feeling much like a chore. By the time I added few more projects and strands to my business I realised that I reached the point when I needed to go back to be more organised. This can mean different things to different people, but I just work with paper A5 diary (one day per page), where I schedule everything. This way I know it will get done, but also it gives me an idea of how much time the task takes (and of course review it for next time). I prefer paper diary, because I can take with me everywhere and I plan my day and make notes whilst staying off-line. My ‘to do list’ is not an actual list. I’m HSP, which basically mean that I absorb everything I see, read, hear and it can be difficult to ‘get rid off’ afterwards. (I’ll blog about being HSP some other time…). I’m mentioning this, because the traditional paper do do list where you cross off your tasks as you do, simply doesn’t work for me. I still see the crossed off task and I still think about it. It still looks like something I need to deal with. So, I’ve designed the following excel spreadsheet, which works perfectly for me (and I hope it might be useful for others too). Each business has it’s own column and rows with gradually starting with the most important jobs, to everyday jobs, future jobs and research. Before I add a new job in I make a judgement what priority it should have allocated. This list lives open on my laptop all the time and I review it everyday. 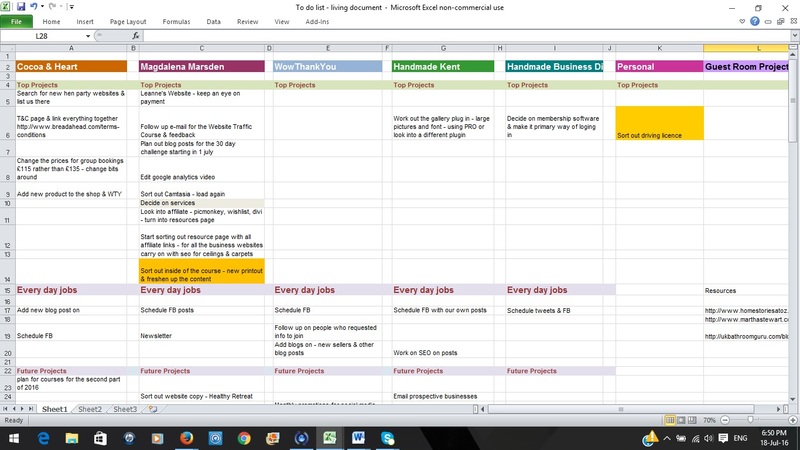 I highlight jobs that need doing that particular day in yellow and delete the task when done. That way I see immediately what to focus on. I know this might be a challenge for a lot of people, but I really think that having a separate days to manage separate businesses or projects really works. I’m sure that you’ve heard that multitasking is far from productive. Every time you switch between tasks, you loose concentration and when you need to get back to the task, it takes longer to focus and re-start the task again. This is not something new, but I found that having a set days, when I focus on a particular business really works for me and helps me to concentrate. This doesn’t mean that I don’t check e-mails or social media for a week if it’s not that particular business day. No, not at all! But the main chunks of my productive time are spend on just one task and one business. So, for example today, I’m working on my business coaching, drafting several blogs, scheduling social media for the next month and reviewing couple of websites for clients. I will check all my e-mails at the end of the day to make sure that urgent e-mails are answered, but I will leave everything else until the day, that’s ‘allocated’ for that business. If your businesses become successful and you want to grow them, you will probably need to outsource some of the work that you currently do. I’ve been lucky that my husband has come on board at the time when I really needed extra help. And I have previously outsourced individual jobs, like book proofreading. Outsourcing can be a chapter on it’s own, so for the time being I will just say, that it’s something that you might need to consider if you want your business to grow. If you want to carry on managing your business and be effective you really need to look at automating as many jobs as you possible can. This means scheduling your social media, batching your work and scheduling blog posts, newsletters and anything else that needs to ‘go out’. Automating is also about having processes in place for all main tasks within your business. When I was working in my corporate job, we had a Quality Manual for each department. At the time it felt a bit tedious to have a prescribed way of doing something, but it was there for a reason. It ensured quality across the company (different people were doing the same task in the same way) and if you couldn’t remembered something, you just looked it up. 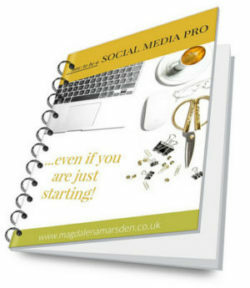 It might feel like a bit of an overkill to have an actual Quality Manual for your business, but even if it’s couple of pages to start off with, it will help you to focus and if you need to employ or outsource your work, you’ll have a straightforward directions to give to people from the start. If you are running couple of different businesses, you are probably the type of person who gets a lot of ideas. And if you are passionate entrepreneur, the chance are that these new ideas are difficult to ignore. But having too many ideas and then try to chase them all, can be pretty dangerous. It immediately dilutes your attention, focus and resources and the chances are that your main business is going to suffer. There are couple of ways to deal with this. I keep an excel spreadsheet and every time I have an idea for a new business or even new project within existing business I write it down, but don’t take any action. Once in a while I review the list against my business plan and current business strategy and see whether any of those new ideas can compliment it or improve what we currently have. You’ve guessed it right, that many ideas just stay ideas…. When I had an idea for Handmade Kent, I was so excited about it that I explained the whole concept to my husband over breakfast and by the evening I had the website up and running. But since this little venture earns just a little more than the website hosting and plugins I needed it to set it up, at the moment, it gets firmly allocated attention time during weekends and evenings and only when I have the time. The chance are that you will be working very hard and even if you outsource some of your work, I’m sure that your workload will be maxed out. To have a break is not a luxury, it’s a necessity. I make sure I have one day a week without work or my laptop. And once every 6 weeks or so, I try to take 3-4 days off to recharge my batteries. Love to know what you think, so leave me a comment below and I look forward reading them all.